Richard Construction, Inc. (RCI) participated, for the first time, in the Houston Business Roundtable Safety Excellence Evaluation Process. The HBR’s safety evaluation process in comparison to others was second to none. RCI was nominated by the Houston-Valero Major Projects Team. Another ABC contractor representing our organization so well; thanks RCI for doing such a great job! ABC’s STEP: Merit-based safety recognition for the Merit Shop! or email them at safety@abc.org. Thanks and congratulations to all our local ABC member companies that participated in the 2016 S.T.E.P. award process and were recognized for their safety performance. Also, this is the second year that the “Donald T. Bouman’s Contractor Safety Award” was given. This prestigious award went to: Echo Maintenance, LLC! Congratulations to all the Safety Achievement Award recipient companies and their employees on jobs well done; you make us proud! "Aggregate Technologies safely removed 340 precast panels weighing more than 2,000 pounds each from a fully operational federal office located on a busy city block by working at night and using two specially designed cranes mounted atop the 22-story building." read the official program. 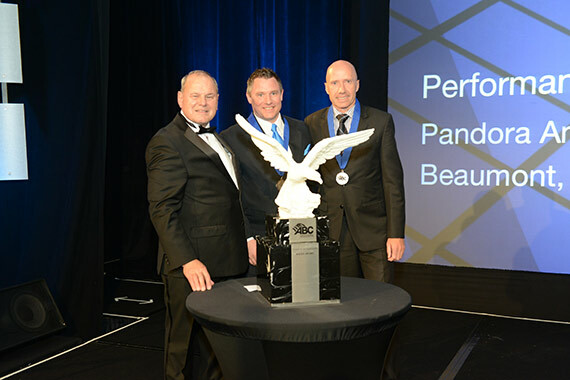 The award was given at the 25th Annual Excellence in Construction Awards Gala held on March 5, 2015, in Fort Lauderdale, Florida. Pictured below is Ben Ard, ATI project supervisor, and Nabil Mimouni, engineer, receiving the award. Details about the project are on the web site. This ABC Eagle award will join the previous award earned by ATI in 2012 for the M.D. Anderson Alkek Expansion project. ZUG, Switzerland--(BUSINESS WIRE)--Foster Wheeler AG (Nasdaq: FWLT) announced today that its Global Power Group is now offering a new turn-key environmentally responsible ash solution for international clients operating the company’s circulating fluidized-bed (CFB) steam generators. Pictured from left to right, John Bernard (ABC-SETX), Greg Hoberock, (ABC-Nat’l), Steven Pellerin (Ohmstede), and Grady Gibbons (ISC Constructors). At the 2013 ABC-National Legislative Conference in Washington, DC, the Southeast Texas Chapter was awarded the “Joe M. Rogers Award”, which is presented to those ABC chapters in each of ten divisions with the highest dollar amount above $50 per member company raised for ABC PAC and $100 per member company for the Free Enterprise Alliance. March 2013—WASHINGTON, D.C. – Associated Builders and Contractors (ABC) today announced that Performance Contractors, Inc.’s work on the Pandora Ammonia/Methanol Turnaround project in Beaumont, Texas, has earned the company an Eagle award in the Industrial - $25-100 Million category of ABC’s Excellence in Construction Awards. Performance Contractors representatives received the award Feb. 20 during the 23rd annual Excellence in Construction Awards celebration at the Harbor Beach Marriott Resort in Ft. Lauderdale, Fla.
After discovering the scope of the project was much larger than planned, Performance Contractors’ responsibilities for this $84 million project expanded to providing the logistics, equipment and fuel for the entire site. 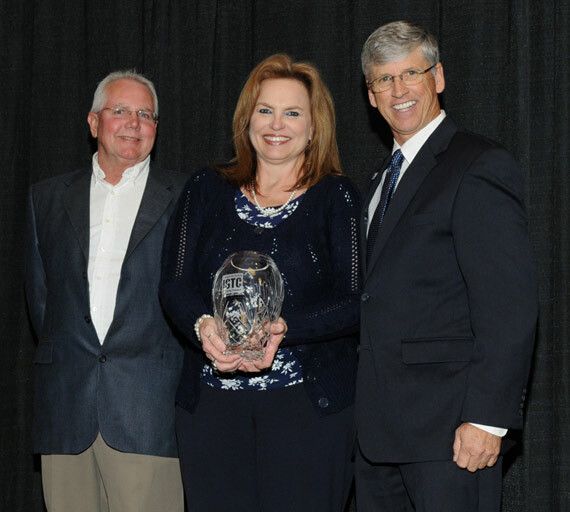 ISC Constructors, LLC was the finalist in the Industrial Safety Training Councils Safety 16th Annual “Safety Excellence Through Training” Awards Banquet held May 10th at the Holiday Inn, Beaumont Plaza in Beaumont, Texas. 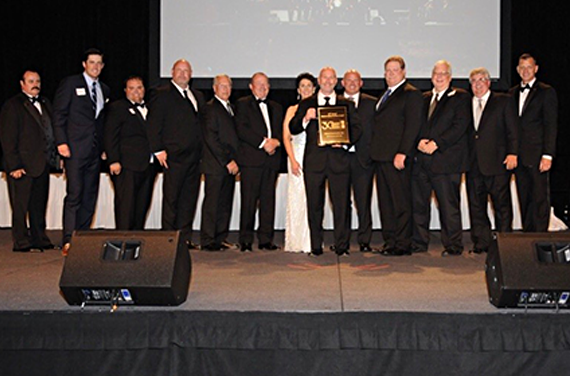 This annual award ceremony recognizes many of the Golden Triangle’s contractors for their safety training programs and ISC walked away with the most prestigious award of the night; the Roy Comeaux Safety Excellence Through Training Award. In order to win this award the recipient must not only exhibit superior levels of consistent safety performance but also demonstrate and maintain remarkable levels of effort in their employee safety training programs. A letter from your insurance company verifying the Experience Modifier Rate. Since the Beaumont office has maintained a recordable incident rate of zero (0) since 2009 locally along with the OSHA Logs and Insurance letter, those items were of easily attainable. However, in order to provide a complete company safety training program it took several hours and days to get that part of the submittal prepared. Our Regional Safety Coordinator, along with an Administrative Asst., copied all the programs, rosters and samples of the tests from all of ISC’s various safety training programs. This, along with organizing all the documentation into a professional look for ISC’s submittal, took the most time to prepare. In all we had five 3” 3-ring binders full of information for our awards submittal. 7 years Worked – achieve one or more years (365 consecutive days) without a lost workday case involving days away from work or a fatality. Needless to say, ISC – Beaumont Region is very proud of all its Safety Team and Field Safety Managers and the consistent efforts put forth to ensure our associates go home safe each and every day. progress in promoting construction site safety across the United States, Canada and the rest of the globe. As one of its core initiatives CURT is committed to working towards continued improvement in construction industry safety performance. promotion of cost effective construction methods. The members, as major consumers of construction services seek to foster improved construction safety performance through recognition of the achievement of excellence and the promotion of proven effective work practices. These awards recognize the important role of owners in managing safety performance and achieving excellent results. The winners were selected from among dozens of applications. The CURT CISE Constructor Safety Awards went to contractors in various categories recognizing their outstanding safety performances over the past three years. <or=500,000 man hours/year-Gribbins Insulation Co., Inc.
>2MM man hours/year-Rosendin Electric, Inc.
publication entitled, “The Construction Owners’ Safety Blueprint,” demonstrates CURT’s commitment to promoting a safer construction industry. 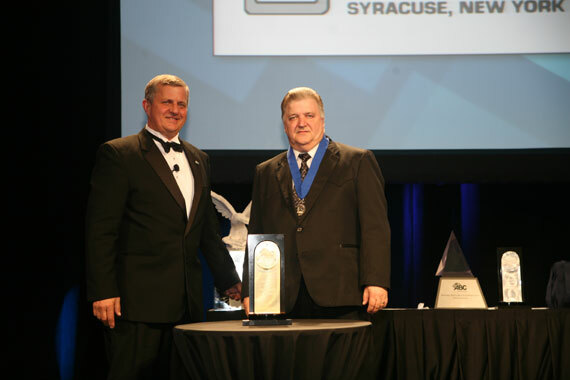 WASHINGTON, D.C .– Associated Builders and Contractors (ABC) today announced that Performance Contractors, Inc., work on the MPP Recommission Project in BASF/Beaumont, has earned the company a Pyramid Award in the Industrial - $5 - $15 Million Dollar Category of ABC’s Excellence in Construction Awards. Performance Contractors, Inc. representatives received the award Feb. 22 during the 21st annual Excellence in Construction Awards celebration at the Waldorf Astoria hotel in Orlando, Fla.
“This project is an outstanding example of the innovation and commitment to superior craftsmanship that embody merit shop construction,” said Michael D. Bellaman, ABC president and CEO. The Excellence in Construction awards program is the industry’s leading competition, developed to honor innovative and high-quality merit shop construction projects and safety programs. The award honors all construction team members, including the contractor, owner, architect and engineer. The winning projects, selected from entries submitted from across the nation, were judged on complexity, attractiveness, unique challenges overcome, completion time, workmanship, innovation, safety and cost. 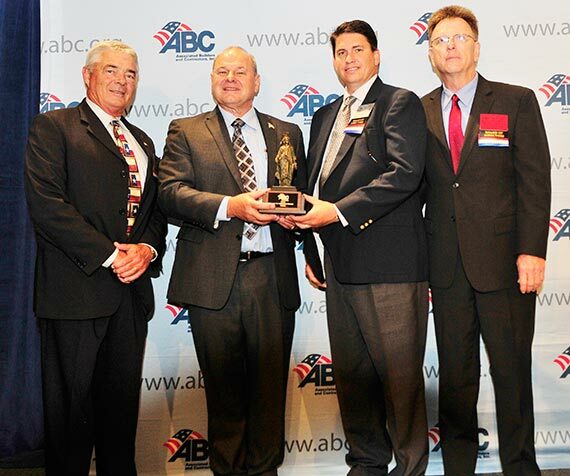 WASHINGTON, D.C. – Associated Builders and Contractors (ABC) today announced that Richard Construction, Inc., Beaumont, Texas, maintained a safety record that has earned the company recognition in the Heavy and Civil Engineering Contractor category of ABC’s National Safety Excellence Awards. 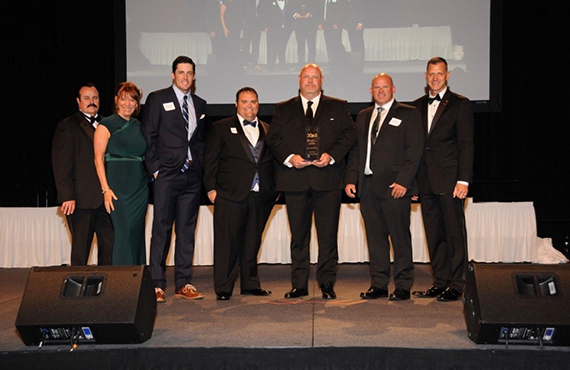 Richard Construction’s representatives received the award February 22 during the 21st annual Excellence in Construction awards celebration at the Waldorf Astoria Hotel in Orlando, Fla. 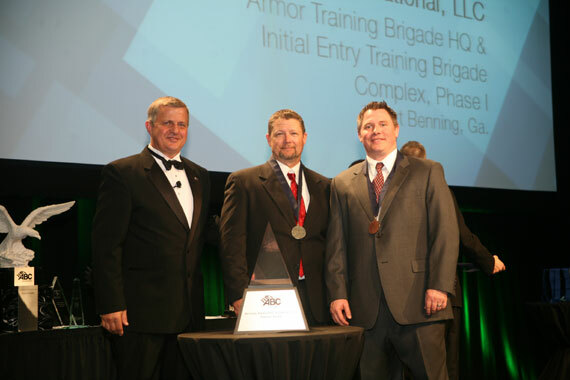 The 2011 National Safety Excellence Award winners were selected from ABC member firms that achieved Platinum status in ABC's Safety Training and Evaluation Process (STEP) program. During the selection process, national safety winners were judged on self-evaluation scores, lost workday case rates, total recordable rates, and interviews conducted by members of ABC’s National Environment, Health & Safety Committee. The National Safety Excellence Awards are presented in three major North American Industry Classification System (NAICS) code categories: NAICS 236 – Construction of Buildings; NAICS 237 – Heavy and Civil Engineering Construction; and NAICS 238 – Specialty Trade Contractors.